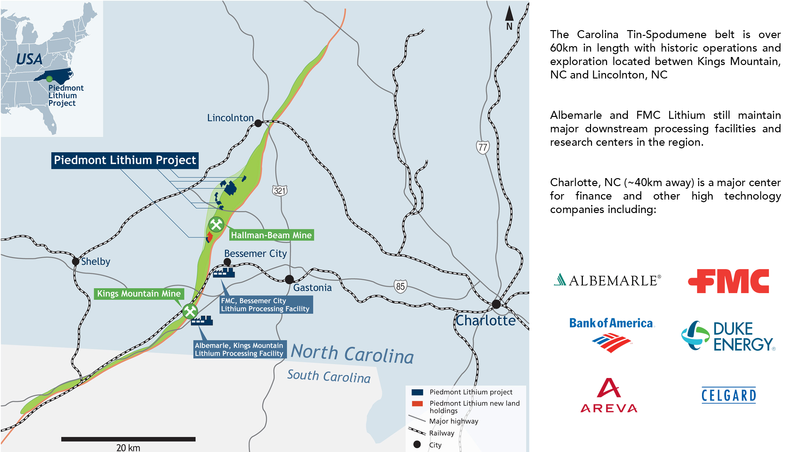 The Piedmont Lithium Project is located within the world-class Carolina Tin-Spodumene belt and along trend to the Hallman Beam and Kings Mountain mines, historically providing most of the western world’s lithium between 1950 and 1990. Our core landholding currently consists of 1199 acres and we are actively and aggressively adding further options to considerably expand our presence in the region. The Piedmont Lithium Project, which consists of options over an initial core landholding is focused on an area that has been explored for lithium dating back to the 1950’s where it was originally explored by Lithium Corporation of America, which was subsequently acquired by FMC Corporation. Albemarle and FMC continue to operate two of the most important lithium processing facilities which are situated on these sites as a result of the rich deposits of lithium contained in the TSB. These facilities are now at the forefront of lithium research and development with FMC maintaining the Center for Lithium Energy Advanced Research (“CLEAR”) lab in Bessemer City, proximal to the Project. FMC’s Bessemer City lithium processing facility is approximately 14 kilometres from the Project whilst Albemarle’s Kings Mountain lithium processing facility is approximately 17 kilometres from the Project. Geologically, the Project lies in the Inner Piedmont belt adjacent to the Kings Mountain shear zone, which separates the Inner Piedmont belt from the Kings Mountain belt to the east. The Company expects to complete its 20,000-meter Phase 3 Drilling Campaign and announce a maiden Resource within Q2 2018. The region is one of the premier localities in the world to be exploring for lithium pegmatites given its favorable geology and ideal location with easy access to infrastructure, power, R&D centers for lithium and battery storage, major high-tech population centers and downstream lithium processing facilities.